As an informed property investor, you should be aware of the value of your property at all times. Certain things can cause the market price to decrease. Some of these things, such as natural disasters, are out of your control. Here are three threats to your property’s value. When mortgage interest rates are low, buyers can afford to spend more on a house. At lower interest rates, their monthly mortgage payments will be lower, and they will pay less over the life of the loan. As interest rates increase, home affordability decreases for potential buyers. They can’t afford to spend as much on the initial purchase price because, with the increased interest rates, their monthly mortgage payments will be higher and they will have to pay more over the life of the loan. Mortgage rate increases not only affect home buyers, but they affect sellers as well. Your home is not as valuable because people have to pay more to buy your home at the higher rates. Before the interest rates rose, your home may have been in the price range of 30 prospective buyers. With the higher rates, this number may have decreased to only 10 prospective buyers. You may have a harder time selling your home at the current list price. You may have to drop your list price in order to appeal to more buyers. Mother Nature can cause a decrease in your property’s value. I’m not talking about the occasional heavy rainstorm or three feet of snow. I’m referring to natural disasters that can wipe out entire communities. Examples of natural disasters that can threaten your property’s value are hurricanes, tornadoes, wildfires, earthquakes, tsunamis, mudslides, and floods. 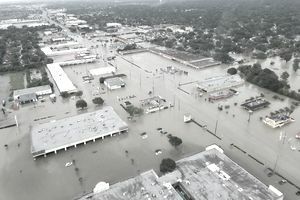 Think of Hurricane Katrina that struck the Gulf Coast in 2005. It left almost 2000 dead and caused more than $81 billion in property damage. The F-5 tornado that struck Joplin, Missouri, in 2011, left 158 dead and caused about $2.8 billion in property damage. These natural disasters can strike without warning and can completely devastate an area. Of course, they do not have to be the most catastrophic event in history to have an effect on home values. Weather patterns can also change over time. When you bought your home, it may not have required flood insurance. One hurricane could come in and cause flooding in your town. The flood zone maps would then be altered and require you to have flood insurance. This requirement will significantly impact the value of your home as people will be hesitant about buying property in a flood zone. Natural disasters will damage your existing property. If you have insurance, you will usually get some money to pay for the damage, but it is rarely enough. You can apply for aid from FEMA, but it is usually hit or miss with whether you will qualify for their aid and how much they will give you. Sometimes these storms completely destroy property and it is not salvageable. Not only do you have to worry about repairing the damage caused by these storms, if your property is still standing, you have to worry about ever being able to sell your property. People will be very apprehensive about buying property in an area that was just devastated by a disaster. Another threat to the value of your property are foreclosures and short sales in your neighborhood. These affect your property value by skewing the comparable sales in your neighborhood down. For example, you have a 3 bedroom, 2 baths, 1500 square foot home. One comparable home sold for $350,000 and another sold for $340,000. A third home was foreclosed on, and it sold for $200,000. This foreclosure significantly impacts the comparable prices and could decrease the price of your property. Having short sales and especially foreclosures on your street decreases the value of your home. Even if they are not direct comparables, as in same square footage and the number of bedrooms and baths, they are in your immediate neighborhood, so can make the entire area depreciate in value. If a neighborhood has a lot of foreclosures or short sales, prospective buyers may be hesitant to purchase there because they are not sure if it is stable and may worry about the future value of their home. How would you feel about buying a home next to a house that had just been foreclosed on? If you were still interested in buying after learning of this, you would likely try to negotiate the price down. What Insurance Do Landlords and Property Investors Need?